Please refer to our policies on Resident Eligibility and Selection, Essential Requirements and Examinations. This is the full 4 year anesthesiology residency training consisting of the UW-linked internship year and 3 years of clinical anesthesia (CA) training. These positions begin in June 2019 and are filled via NRMP. These positions start on July 1, 2019 and 2020 respectively, filled via NRMP: Applicants will need to complete a clinical base/internship year (CBY) prior to starting the CA1 year. Normally applicants apply for the clinical base year such as a transitional or preliminary program for June 2019 at the same time as applying for the CA position for 2020. The requirements of the clinical base year are as follows—At least 6 months of rotations caring for inpatients in internal medicine, pediatrics, surgery, or any of the surgical specialties, obstetrics and gynecology, neurology, family medicine, or any combination of these. There must be one month and no more than two months of critical care and emergency medicine and up to one month may be taken in anesthesiology. This program begins with the CBY year and followed by 4 years of training in clinical anesthesiology and advanced training in critical care medicine. These positions are filled via NRMP. 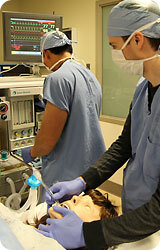 This is a program designed for applicants who wish to pursue a research career following anesthesiology residency. A full description of this program is available at this link. In addition to the ERAS application (below), a separate application is also required; this 2 page form may be downloaded below and submitted by email. Interested applicants are strongly encouraged to discuss their interest in the program with Dr. Matthew Hallman. Applicants to the Bonica Scholars Program will be invited to attend a special Q&A session held 2-3 times during the interview season on Monday afternoon, after the Monday general interviews. Applications are accepted via the Electronic Residency Application Service (ERAS) — administered by the Association of American Medical College (AAMC). Letters of recommendation: Three or more letters of references, including one from an anesthesiologist with whom you have worked. (not including MSPE [Dean's letter]). 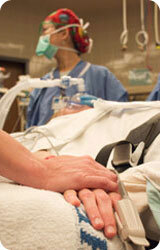 This letter should address your performance and commitment to the study of anesthesiology. Personal statement: A narrative statement which should be no longer than one typewritten pages. It should include your reasons for choosing anesthesia as a specialty. This statement affords you the opportunity to provide us with a personal profile and to point out any unusual features of your application. 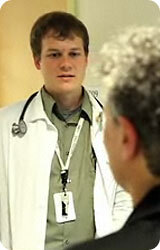 Transcript: Your official transcript from your medical school. The program will review completed applications in the order they are received with priority going to those received early. The deadline for applicants to be considered is October 30, 2018. Applications will be carefully reviewed immediately after ERAS opens, the recruitment committee will review all MSPE letters once they are available on Oct 1, 2018. All interview invitations will be sent as soon as possible following release of the MSPE by medical schools. Formal interview days take place on Mondays (2nd Tuesday in November due to Veterans holiday; 3rd Tuesday in January due to Martin Luther King’s holiday 3rd Monday). The number of interview places is limited and applicants are asked to provide a prompt response to an invitation for interview and also to provide ample notification (ideally a minimum of a week) if they choose to withdraw from an interview. For applicants interested in the Bonica Scholars (Research) Track, there will be an additional program on November 26th and December 10, 2018, after the regular scheduled interviews.